, a core-alignment splicer with the world’s highest possible fiber image magnification rate, is regarded as the most effective and efficient fusion splicer on the market. View 3’s 5 inch high-resolution color LCD touchscreen display with user-friendly intuitive GUI (Graphic User Interface) provides large and distinct fiber images to users. By double-tapping the display screen, operators are able to Zoom In & Out the image to the world’s most robust magnification of 520x. View 3features maximum work efficiency through the rapid heating period of 13s as well as the ultra-high battery capacity of 355 splice/heat cycles. Moreover, the 3 LED lights provide vibrant splice condition to the consumers performing under dark settings. View 3 provides you with the most reliable work experience to our very important users. By double-tapping the display, owners can easily zoom in the fiber image to the industry’s maximum magnification of 520x. Fiber condition is rather conveniently examined with unaided eyes. 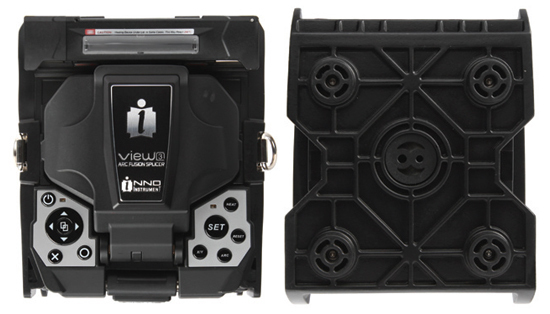 View3, a core-alignment splicer with the world’s highest possible fiber image magnification rate, is regarded as the most reliable and innovative fusion splicer available. 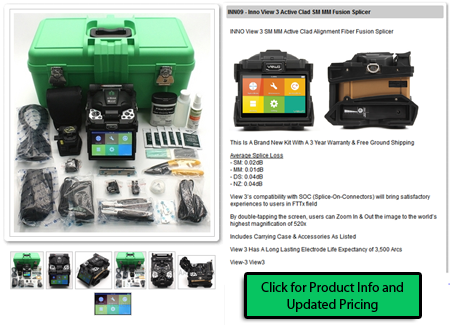 View3’s 5 inch high-resolution color LCD touchscreen display with user-friendly intuitive GUI (Graphic User Interface) gives you large and very clear fiber images to users. By double-tapping the monitor, viewers can Zoom In & Out the image to the world’s most powerful magnification of 520x. View3 allows maximum work effectiveness through the hasty heating period of 13s in addition to the ultra-high battery capacity of 355 splice/heat cycles. Moreover, the three LED lights provide vivid splice condition to the owners working under dark conditions. View3 provides the best work experiences to our extremely important clients.